From travel writing to memoir, journalism to fiction, research plays an important role in keeping readers glued to your words. 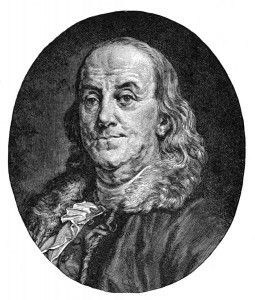 Most best-selling books teach us about something or somewhere we didn’t already know about. Readers love to learn something new and usually respect those authors that subtly teach them a new thing or two. Research can also inspire us as writers. Citing a few examples from my recent literary tour of Switzerland, I’ll bring pictures of and talk about: the waterfalls where Arthur Conan Doyle killed off Sherlock Holmes; the chateau/pension where Mary Shelley came up with the idea for “Frankenstein”, the town that inspired Rivendell for Tolkien; and of course a few of the places Mark Twain visited and talked about in his travel memoir “A Tramp Abroad”. I’ll also pass around copies of in-flight magazines to open the floor up for discussion about using travel writing, or other areas of researched expertise/experience, as a way to supplement your other writing income to help those in attendance feel good about, or at least ponder (and potentially monetize!) what they already know. As always, feel free to to bring a short, 500-1000 word excerpt of either your work, or the work of an author that you admire, that exemplifies the use of research. Moderated by Eric James Miller. Come out and see what your local writing community has to offer! Twists and clues are MOST COMMON in mystery novels, although we see them in other genres such as romance, sci-fi, Westerns, YA novels. 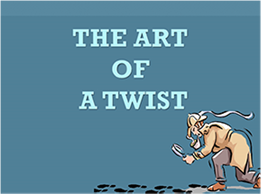 Actually, twists and clues work in almost every sort of story you can think of. They intrigue the reader…challenge them and keep those pages turning. The important word here is “CLUE.” It is imperative to drop clues so that when the twist is revealed, the reader will have had the opportunity to try to figure out if there is a twist and what it might be. This fun discussion explores how the same clues can produce different twists in different genres or even in the same genres. Authors have to make a lot of decisions. What story do they want to tell? What characters do they want to bring to life? Should they self-publish or try to find an agent? How to carve out time to write when you’re in a relationship or have a family? What can they do to sell more books? Our discussions are informative, but informal. Everyone will have the chance to share their experiences and ask questions about various aspects of being a working writer. As always, the conversation is likely to morph and evolve in different directions depending on what everyone brings to the table with their cup of joe, latte, or tea. We look forward to seeing you for good company, good conversation and good coffee! WHERE: The Coffee Press inside the Paseo Verde branch of the Henderson Public Library across from The District. Join us for the next Writers of Southern Nevada Writers Roundtable, “Beginnings: The Fine and Frustrating Art of the First Page,” at 6:30 p.m. on Tuesday, February 7, at the Paseo Verde Library’s Coffee Press Cafe, 280 S. Green Valley Parkway. UNLV Narrative media professor Greg Blake Miller hosts this fun, freewheeling discussion; bring openings from your favorite books, articles, and stories—fiction and nonfiction—as well as from your own work. 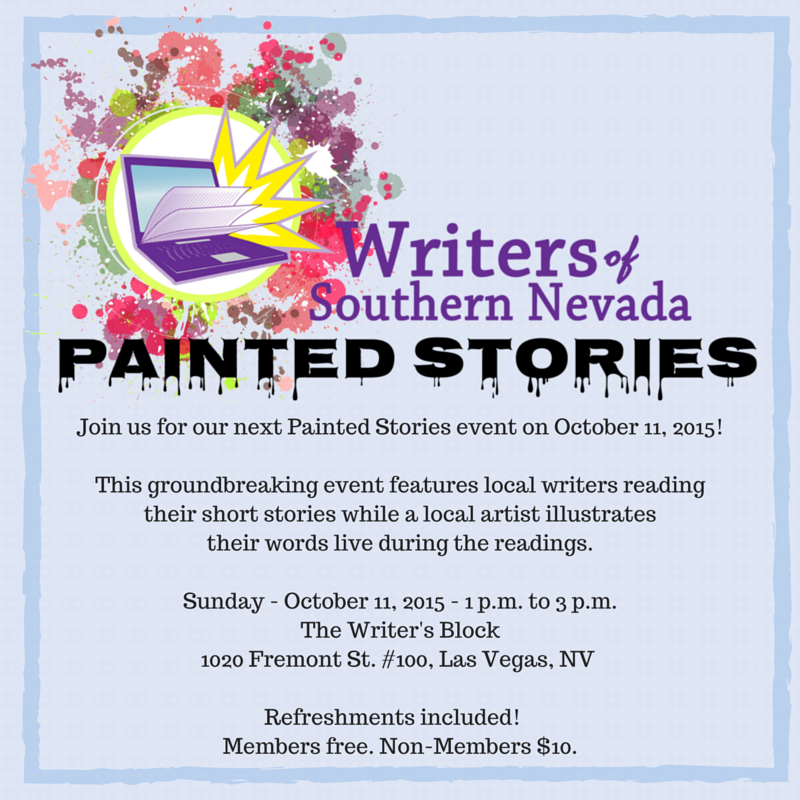 This event is free to all Writers of Southern Nevada members and $5 to guests. 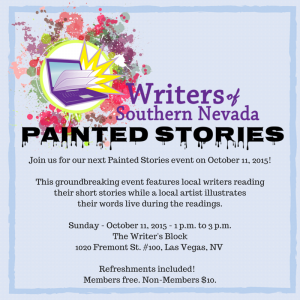 Proceeds go to Writers of Southern Nevada, a local 501(c)3 literary non-profit dedicated to bringing together and enhancing the literary community of southern Nevada. Do You Need a Writers Group? Stephen King once said that “writing is a lonely job.” It certainly is, just you and the pen or keyboard. Unless you are a true loner, it is important to have contact with other people regularly. Though any human contact is helpful, connecting with others who understand what you do can help you maintain your sanity. Fortunately most cities and towns have writers groups where you can socialize and network with other writers while you enhance your knowledge about various aspects of the craft and business of writing. Groups range from a handful of writers meeting in a coffee shop to large national organizations such as the Romance Writers of America, Mystery Writers of America, Sisters in Crime, etc.. Some groups may cater to a specific genre while others are more general. Some groups are great for those just starting out with others being geared to more experienced writers. Search for a group that offers what you are looking for, if you aren’t sure what that is go to different groups until you find one that feels right. You will discover many different formats as you explore the groups. Some are created more for socializing and networking, others are geared toward education and will usually feature speakers on various writing related topics, groups exist that deal primarily with craft and writing techniques and still more focus on critiquing the work of their members. Attend the group or groups that offer what you need or want the most and see if they will be a good fit for you. To get the most out of any group you should get involved. Offer to help out or join the volunteer team. This will allow you to get to know more people and increase your own visibility within the group. Being involved may also allow you to have a voice in the direction of the group. Your role in the group may also open doors for you in the local writing community as you become known as an active participant rather than simply a spectator. Perhaps the most valuable benefit of joining a group is the connection you are able to make with other writers and people in the literary community. You may be able to find a mentor or a sounding board for your ideas and will probably make new friends. That’s why it’s important to feel comfortable and welcome in whatever group you choose. So find one or more local groups and join but remember, the more you put into it the more you will get in return. It’s a wise investment.